We’d love your help. 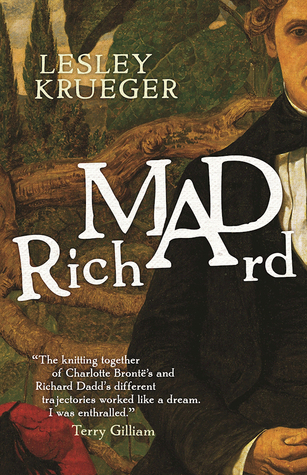 Let us know what’s wrong with this preview of Mad Richard by Lesley Krueger. To ask other readers questions about Mad Richard, please sign up. First impressions upon finishing: Hm. Not the sort of thing I read regularly, but I think it was pretty good! Review originally posted 5 April 2017 at Falling Letters. I received a copy from the publisher in exchange for my honest review. ECW Press, an independent Canadian publisher, has become my go-to for finding new fiction that expands my reading horizons. The linking of two historical figures not popularly known to have interacted and the “questions about art and artists, class, obsession and First impressions upon finishing: Hm. Not the sort of thing I read regularly, but I think it was pretty good! ECW Press, an independent Canadian publisher, has become my go-to for finding new fiction that expands my reading horizons. The linking of two historical figures not popularly known to have interacted and the “questions about art and artists, class, obsession and romance” drew me to Mad Richard. Written by Richard’s “first cousin-in-law five times removed”, the book apparently draws on the author’s knowledge of “family information unknown to biographers” (author bio in book). Mad Richard shares two protagonists, painter Richard Dadd and author Charlotte Bronte. I found Richard to be a likable character – well-rounded, considerate, and yet somehow not dull, haha. I specifically noted my fondness for Richard on page 113, where he awakens from a fainting spell, has a small epiphany about his art, then states “I’m famished. Don’t imagine I could have a chop?” I knew just a smidgen more about Charlotte than I did about Richard going into this book. Mad Richard brings her to life in a way I’ve not experienced Victorian writers before. They have always felt so distant from writers I know of today or even from the 20th century. Krueger portrays Charlotte’s hopes and fears in a relatable manner. My primary qualm with Mad Richard is that the story moves very slowly. The book begins with Charlotte’s visit to Richard in Bedlam. They interact only once. The remainder of the book tells Charlotte’s story from that moment onward, while telling Richard’s story from his teen years to the time he commits a murder. Charlotte and Richard’s stories were less interconnected than I expected. The connection is more in the parallels in their situations. The Bottom Line: An enlightening work of historical fiction, although dry at times. Recommended for those interested in people creating art during the Victorian age. Mad Richard moves deftly between the lives of novelist Charlotte Brontë and the obscure artist Richard Dadd. They are an unlikely pair to pull together but Lesley Krueger is a gifted writer who weaves an intriguing tale rich in historical detail and compelling characters. The book opens with Brontë, one of the most acclaimed authors of her time, visiting Dadd in Bedlam, the madhouse where he has lived for the last 10 years. This brief encounter, the only direct meeting between them, opens the doo Mad Richard moves deftly between the lives of novelist Charlotte Brontë and the obscure artist Richard Dadd. They are an unlikely pair to pull together but Lesley Krueger is a gifted writer who weaves an intriguing tale rich in historical detail and compelling characters. The book opens with Brontë, one of the most acclaimed authors of her time, visiting Dadd in Bedlam, the madhouse where he has lived for the last 10 years. This brief encounter, the only direct meeting between them, opens the door to an exploration of their contrasting lives and the question of where genius springs from. Krueger does a marvelous job revealing the inner most thoughts of Dadd and Brontë, who as artist and writer are connected by a drive to express themselves through their creativity, often overcoming anguishing self-doubt and internal turmoil. We follow Dadd’s ill-fated life from his promising start at the Royal Academy, where his precocious group forms The Clique and he earns an early exhibition at the Society of British Artists. Yet, Dadd is worried there is no anger in him “no chip on his shoulder he dared you knock off, no sense of neglect to nip his ballocks and give him a raging, urgent sense of momentum”. He constantly compares himself to Charles Dickens, a neighbour from his youth, whose fame he envies. Then Dadd is bullied into accompanying an English gentleman as his “pet” artist on a grueling trip across Europe, the Holy Lands and Egypt. This is his undoing. He gradually loses his mind becoming a disciple of the god Osiris and committing murder upon his return to England. Interspersed with Dadd’s tragic biography is the introspection of Brontë as she waits in agony for the reviews of her third book, Villette. But that is nothing compared to the torment she feels when she realizes that her love for her publisher is unrequited. With her mother, sisters and brother already dead, she faces a lonely life – an unbearable life. She contemplates writing “about this feeling, how it felt to be the inmate of a nightmare, a portable Bedlam”. Instead, she comes to terms with her limited options, lowering her expectations to marry to a man she has already rejected. As successful as she is, Brontë recognizes that her genius on its own will not provide financial freedom. The book ends with another visit to Bedlam. This time it is Charles Dickens bringing news to Dadd, who continues to carry out his delusional pursuit of the god Osiris through his painting. This is a beautifully written book that is a pleasure to read. I am a fan of historical fiction, so this novel, which imagines the inner and outer lives of both artist Richard Dadd and novelist Charlotte Bronte, appealed to me. The author imagines a meeting between the pair, which serves (only) as a starting point for the comparison of the two figures, and also serves as a jumping off place for the author's themes of the artistic temperament, the life and challenges of an artist, the relationships both familial and other, which This was a Goodreads giveaway. I am a fan of historical fiction, so this novel, which imagines the inner and outer lives of both artist Richard Dadd and novelist Charlotte Bronte, appealed to me. The author imagines a meeting between the pair, which serves (only) as a starting point for the comparison of the two figures, and also serves as a jumping off place for the author's themes of the artistic temperament, the life and challenges of an artist, the relationships both familial and other, which both enrich and strain an artist's ability to excel at their art, etc. Their meeting takes place at the beginning of the novel, which is the sort of end of the story for Dadd, while it is the beginning of Bronte's narrative. The novel alternates between the stories of both artists. As an exploration into the artistic temperament and the familial and practical challenges to that art, this is an interesting book. There is also the interesting theme of the male vs female artist and how one's gender influences one's art and provides different challenges, restraints, and constraints to that art. I found Charlotte Bronte's story to be more compelling than Dadd's, though his is presumably the chief storyline here. His history is episodic, jumping back and forth in time. This was, to be honest, one of my peeves about this book. The Dadd part of the narrative was disjointed temporally, jumping back and forth between time periods of the artist's history, starting when he was a boy, jumping forward to his artistic studies in London, back again, forward, back some more. The episodes themselves did not hold my interest greatly. They are meant, I believe, to illuminate the nature of the relationship between Dadd and his father and serve as a tragic contrast to his later madness, as well as build a picture of the artist as a young man. From prairiefire.ca. Review by Dana Hansen. Lesley Krueger—A distant relative of the Victorian era painter Richard Dadd— creates a generous and thoughtful portrait of the once-promising artist’s descent into madness, murder, and imprisonment in London’s Bethlem Royal Hospital’s psychiatric facility, infamously known as Bedlam. Dadd is not the only artist to feature in Mad Richard; the novel begins in 1853 with a visit to Bedlam by writer Charlotte Bronte. She is trying to determine the subject of From prairiefire.ca. Review by Dana Hansen. Dadd is not the only artist to feature in Mad Richard; the novel begins in 1853 with a visit to Bedlam by writer Charlotte Bronte. She is trying to determine the subject of her next book and is considering writing a social novel along the lines of the work of her contemporary, Charles Dickens, who makes several important cameos in Mad Richard. For inspiration, she decides to tour Bedlam and meet Richard. While their meeting is brief and the only point of their contact in the book, the novel goes on to tell their stories in tandem—Richard’s by recounting his youth and past experiences that have brought him to his present and tragic condition, and Charlotte’s by imagining her life as a celebrated mid-career novelist, an unmarried woman approaching forty, and someone very uncertain about what the future holds for her. This may seem an unusual pairing of historical figures with quite different life trajectories around which to structure a novel, but Richard and Charlotte have something very much in common: they are both struggling to understand the use of art and to define themselves as artists in a world determined to dictate the shape of their lives and the scope of their artistic vision. In their meeting at Bedlam, they share their similar views on the condition of being an artist, setting the tone for the novel’s focus on dualism and what Richard refers to as “one’s own second self…as obstinate and vicious a devil as we could desire to oppose” (5). Familiar with ancient Greek and Egyptian beliefs about the dual nature of humans, and speaking no doubt to his own tortured state, he asserts to Charlotte, “I believe a strong genius is most likely antagonized by a strong beast or devil” (5). Unfazed by the madman’s proclamation, Charlotte commiserates: “I believe what you say. I believe that each artist is a divided soul. We poor sinners carry whatever talent we have like a burden” (5). For Charlotte, the burden of her talent has resulted in an unconventional life for a woman in 19th century England. As an unmarried woman living with an aged father following the passing of her famous brother and sisters, she faces the prospect of losing her home when her father dies. Despite earning an income from her writing, she knows it will not be sufficient to sustain her. She must consider whatever opportunities for marriage are still available to her, and that means seriously entertaining a proposal from her father’s curate, Mr. Nicholls. While he is not a choice favoured by her father, nor can he compare to the dashing figure of her publisher George Smith, Mr. Nicholls appears devoted to Charlotte whose loneliness is palpable: “My sisters made the difference. Since they left me, the parsonage has fallen silent, and it is an oppressive, pulverizing silence. Life alone is a ballet without music” (190). Charlotte is torn between societal expectations that she should marry, compounded by her own sense of isolation, and her desire to continue writing. The acceptance of Mr. Nicholls’ proposal, while certain to satisfy her desire for companionship and to continue living at the parsonage, seems to suggest to Charlotte a sort of resignation to her situation, a stepping away from her literary ambitions. In part, this turning toward marriage as an alternative to writing is fueled by a faltering confidence in her success, and by her concerns about the critical reception of her work. While she might be drawn to write about the life and regrettable circumstances of Richard Dadd or her brother Branwell for her next book, Charlotte knows that “taking on such a project would be perilous. The critics already called her unfeminine” (53). “Success was improbable,” she thinks, “continued success so unlikely that courting it seemed like hubris, like folly. Easier to reverse herself and accept the proposal she’d received from Mr. Nicholls. Stop trying. Stay home” (53). The uneasy decision that Charlotte ultimately makes to stay home, as the novel and history demonstrate, results in her untimely death, and Krueger’s subtle rendering of Charlotte as a tragic figure leaves us wondering what more might have come from this fine artist had she perhaps felt more free to make different choices. Similar to Charlotte, Richard finds his choices—particularly regarding his artistic output—circumscribed by the people and circumstances in his life. His chapters in the novel, more plodding and less intimate than Charlotte’s, detail his adolescence growing up along the River Medway in a family of multiple brothers and sisters, each with a vocation determined by their father Robert Dadd. A man driven by his own scientific and intellectual pursuits, Robert determines that Richard will be the artist in the family. Entering his young adulthood, Richard dutifully complies, though the pressure to compete for fame and recognition with his fellow artists and luminaries of the day, including the much-envied Dickens, is overwhelming. When he finally experiences some progress and determines that he really wants to paint is “Shakespearean subjects. Keats. The liminal; one of my favourite words. Puck, Titania…fairies”(157)—Richard is compelled by his father to consider more practical, marketable subjects for his painting. It is in pursuit of this marketability that a fateful decision is made for Richard by his father: he will accompany the wealthy Sir Thomas Phillips on an extended tour of parts of Africa, the Middle East, and Europe, all with the purpose of providing, as a “pet artist” (205), paintings for Sir Thomas’s future book. The tour is Richard’s undoing, and it is where he experiences a psychotic break that precipitates the horrific act—very briefly and almost offhandedly described by Krueger—that sends him for the rest of his days to Bedlam. I was disappointed in "Mad Richard," which has a promising presence and gets off to a fine start but unravels toward an unsatisfying end. The character of Richard Dadd himself--artist, brother, and finally insane and a killer--is, believe it or not, not very compelling. The part of the story that I found interesting is Charlotte Bronte, about to publish "Villette," visits Richard in Bedlam. She's considering taking her writing in a new direction, toward the social realism currently popular throug I was disappointed in "Mad Richard," which has a promising presence and gets off to a fine start but unravels toward an unsatisfying end. The character of Richard Dadd himself--artist, brother, and finally insane and a killer--is, believe it or not, not very compelling. The part of the story that I found interesting is Charlotte Bronte, about to publish "Villette," visits Richard in Bedlam. She's considering taking her writing in a new direction, toward the social realism currently popular through the work of Charles Dickens. Will her visit to the madhouse inspire her to move in that direction? Charlotte is the last child of the Bronte family, her brother and sisters are dead, and only her father and family ghosts remain in that drafty rectory in Haworth. She's in love with her editor, but another man offers marriage and a way to move ahead. I found myself skimming Richard's story to catch up with Charlotte's next step. Mad Richard is very well written and offers some sparkling appearances by Dickens, his father, and Mrs. Gaskell. Lesley Krueger fits them seamlessly into the narrative. Charlotte dies off-stage, a sort of sidebar to the story. But Richard, mad or not, was not enough to bind me to the story. The idea that great art exacts a great price is common. Perhaps we like the idea of the tortured artist because it makes it easier for us to be content with our lesser talents. We may not be geniuses, but at least we aren’t Van Gogh, or Sylvia Plath, or in the story of Mad Richard , Richard Dadd and Charlotte Brontē. Author Lesley Krueger begins her book with a meeting between Dadd and Brontē after Dadd is institutionalized a criminally insane after committing a murder. This meeting is the ration The idea that great art exacts a great price is common. Perhaps we like the idea of the tortured artist because it makes it easier for us to be content with our lesser talents. We may not be geniuses, but at least we aren’t Van Gogh, or Sylvia Plath, or in the story of Mad Richard , Richard Dadd and Charlotte Brontē. Author Lesley Krueger begins her book with a meeting between Dadd and Brontē after Dadd is institutionalized a criminally insane after committing a murder. This meeting is the rationale for weaving their narratives together. Most of Dadd’s story is told retrospectively, the story of how he came to be in Bedlam while Brontē’s story continues from that meeting. Brontē’s story is interesting and compelling. She is the last surviving child, Branwell, Emily, and Anne having died just a few years earlier. Her father is old and frail. She is past what people consider “marriageable” and her only suitor is someone her father thinks beneath her, his former curate. She wants marriage though maybe not to the curate. Brontē was one of Sady Doyle’s trainwrecks in her magnificent book on how we judge women. In Krueger’s book, Brontē has an inner core of strength that challenges her father and seeks what just might be happiness, but can she write and be happy? Dadd’s story is that of a favorite son whose artistic talent is fostered by a doting and truly interesting father. His father is far more interesting than Richard, but Richard achieved some fame, not just for being a murderer, but for his art. With his father’s support and his real skill, he is beginning to make a name for himself as an artist. He founded The Clique, a group of artists who focused on genre painting and were known for rejecting Academic Art and hating the Pre-Raphaelite Brotherhood. He knew and was known by most of the artistic elite and knew Charles Dickens since childhood. Life would have gone well for him, but he went on this nine month tour of Europe, the Levant, and Egypt and returned mentally ill. He believes he had a revelation, his family thinks he had sunstroke. Probably modern science would say he had schizophrenia. Lesley Krueger is a skilled writer and creates a good sense of time and place. I enjoyed her Brontē narrative quite a bit. I was bored, though, by the Dadd narrative. I considered quitting the book altogether but when I considered how far I had already read, I kept going, but with a “why am I reading this?” refrain in the back of my head. The Brontē story was disciplined and focused on what took the story forward. The Dadd narrative was expansive and included everything, even the kitchen sink. The contrast could not be more stark. With Dadd we were given excruciating family details and goings-on while with Brontē, even the famed siblings were incidental, though in her thoughts. When I finished the book, I discovered that Krueger’s husband is a descendant of Dadd’s uncle which explained the impulse to indulge in the family stories. It makes for good family history, but not compelling fiction. The question of what price art is not answered by this book. Dadd did not fall ill because he was an artist. His unartistic younger brother became mentally ill as well, though thankfully was institutionalized before killing someone. His sister, possibly suffering from postpartum depression tried to kill her baby. She was not an artist either. Brontē did not die because she was an artist. It is implied that she did not write more books because she was happy, but that is speculating far beyond the evidence. My dislike of Mad Richard does not mean I think Krueger is a poor writer. I think she effectively created multi-dimensional characters. The time and place felt authentic and fully realized. She excelled at describing the setting, the rush and clamor of the souk and the expansive light of the desert, for example.If she had edited the Dadd narrative with the kind of scalpel she edited Brontē, this might have been an excellent book. I was provided a e-galley of Mad Richard by the publisher. I received a free digital review copy of Mad Richard by Lesley Krueger from the publisher (ECW Press) through a Shelf Awareness giveaway. I will confess that when I received the review copy, I had mostly forgotten exactly what the book was. All that I remembered was that it involved a man’s descent into madness. I could not remember if it was fiction or non-fiction. I quickly learned that this is harder to sort out when you have a digital copy. There is no back cover to refer to, no spine with a I received a free digital review copy of Mad Richard by Lesley Krueger from the publisher (ECW Press) through a Shelf Awareness giveaway. I will confess that when I received the review copy, I had mostly forgotten exactly what the book was. All that I remembered was that it involved a man’s descent into madness. I could not remember if it was fiction or non-fiction. I quickly learned that this is harder to sort out when you have a digital copy. There is no back cover to refer to, no spine with a category inked across the bottom. I resorted to the internet to find out that this was a novel based on the real lives of Richard Dadd (a young artist who ends up tucked away in Bedlam) and Charlotte Bronte. I was excited to start reading. Historical fiction involving madness, murder, and artists. Sounds great. The novel starts in Bedlam. Charlotte Bronte is visiting the mental hospital, though her reasons for being there were not clear to me. While there, she meets Richard Dadd, a convicted murderer who believes that the Egyptian god Osiris is directing him to kill the devils dwelling within human men. Dadd and Bronte seem to have some sort of understanding of each other during this meeting, some sort of connection. From there, the novel skips in time. We meet young Dadd in the early days of his career as an artist and follow him on his journey to Bedlam. We see Bronte struggle with being a female writer and balancing that with the demands of her health and family. This is where I started to have trouble with the story. There was so much jumping around in time that I had difficulty knowing where I was in the story. To compound the problem, characters where often physically in one time, but remembering other events in the past. By the time I got to the end of the novel, I really had no sense of the overall flow of time in the story, the sequence of events. I was also disappointed to not see any interaction or connection between Dadd and Bronte past the first chapter. At the very end of the novel, Dadd remembers meeting Bronte when he sees a book written by her. Though Bronte’s story moves forward from her meeting with Dadd, I don’t recall any moment of reflection, a moment of Bronte thinking about the young man in Bedlam. Perhaps the most interesting tidbit of the novel was the author bio at the end. Lesley Krueger is distantly related to Richard Dadd (”first cousin-in-law five times removed”). The novel is based not only only public records, but on information held within the family. I think that making this story creative nonfiction might have worked better for Lesley Krueger. I did not think that the juxtaposition of Bronte and Dadd did much for me as a reader. I would have been far more interested in a personal story looking at the life of Dadd and the possible trickle down through the generations. The illness that struck him is likely genetic (both his brother and sister suffered from issues during the novel, and I presume in real life). Comparing his life to his descendants, looking for madness there, would have been a more powerful story, in my opinion. Another read to challenge myself. It was worth it. This is not only the story of Richard Dadd but also of Charlotte Brontë and Charles Dickens. I knew relatively little of Bronte and Dickens and absolutely nothing about Dadd. I was like a fresh canvas ready to absorb all there was to learn. Lesley Krueger made me look up a fair amount of words while reading her novel, for this I thank you ! I’ve added chiaroscuro and pusillanimous to my ever growing list of new and unusual to me words. She really Another read to challenge myself. It was worth it. Lesley Krueger made me look up a fair amount of words while reading her novel, for this I thank you ! I’ve added chiaroscuro and pusillanimous to my ever growing list of new and unusual to me words. She really does have a sophisticated writing style. It’s remarkable how through some research and oral history Lesley Krueger was able to piece together this story. I can’t imagine all the time it must have taken to research this novel ! The story is told two fold; one is that of Charlotte Brontë, the other is that of Richard Dadd. As I was reading; chapter after chapter – I really didn’t know how all three would connect. I still don’t really fully understand what held these three together. I think that was the major issue I had after finishing the novel. Perhaps what bonded this trio was their dreams, their art or the hold their fathers had on them? … For the life of me, I can’t put my finger on it. Because I did a little sleuthing on google, I knew how things would end for Richard Dadd but that didn’t take away anything while I was reading it. The part in the novel while he was on tour dragged on a bit for me. In all honesty, I was more interested in the Charlotte Brontë bits within the novel than those of Richard Dadd. Myself an aritist, I understood Dadd’s struggle to paint what he wanted vs what his clients found fashionable for the time. There is an immense satisfaction getting through something you are challenging yourself with though. It seems that I am doing a lot of that lately. As I was reading Mad Richard, I’d often find myself on google reading about Dadd and Bronte. I’ll admit to not being much of a classic’s reader and I’ve promised myself that I will read a Bronte novel soon. Any recommendations? When we look a Starting with Charlotte Brontë and her visit with Dadd in Bedlam, the one visit between them, and the jumping off point for Brontë’s and Kruegers exploration of the genesis of artistic genius, and the role that childhood, experiences and learning play into their craft and ultimate ends. While one would not instantly equate the two, Krueger uses reflections and inner dialogue from both to help set the scene and provide plenty of “I never thought of it that way’ moments for readers. This is the fictionalized history of Victorian artist Richard Dadd, and of Charlotte Brontë's last two years. Krueger links the two through a visit that Brontë made to Bedlam to meet Dadd, and through their mutual acquaintances in the world of Victorian literature. Charles Dickens is also featured, and several prominent artists have cameos. The link between Brontë and Dadd is tenuous--and did they actually meet outside of Krueger's mind?--and yet the novel flows easily back and forth between the This is the fictionalized history of Victorian artist Richard Dadd, and of Charlotte Brontë's last two years. Krueger links the two through a visit that Brontë made to Bedlam to meet Dadd, and through their mutual acquaintances in the world of Victorian literature. Charles Dickens is also featured, and several prominent artists have cameos. The link between Brontë and Dadd is tenuous--and did they actually meet outside of Krueger's mind?--and yet the novel flows easily back and forth between the two, comparing and contrasting their personalities and artistic temperaments. Dadd's slow spiral into madness is both believable and touching. The prose is beautiful, at times nearly poetic. The story moves seamlessly back and forth in time and between characters, never feeling disjointed. Interesting conjecture about what would happen if writer Charlotte Bronte and mad murderer Richard Dadd met. The story opens with scenes from Bedlam, a psychiatric hospital where Dadd is a patient and Bronte a visitor was interesting. Tidbits about Charles Dicken reflect another aspect of the period. While the language was appropriate and the culture portray realistically, there was little depth to the characters. Dadd was mentally ill. Bronte quest as a writer is overshadowed by her role as wif Interesting conjecture about what would happen if writer Charlotte Bronte and mad murderer Richard Dadd met. The story opens with scenes from Bedlam, a psychiatric hospital where Dadd is a patient and Bronte a visitor was interesting. Tidbits about Charles Dicken reflect another aspect of the period. While the language was appropriate and the culture portray realistically, there was little depth to the characters. Dadd was mentally ill. Bronte quest as a writer is overshadowed by her role as wife. The various stages of their lives were awkwardly joined making the plot difficult to follow at times. LibraryThing Member Giveaway randomly chose me to receive this book. Although encouraged, I was under no obligation to write a review. The opinions I have expressed are my own. Mad Richard is Richard Dadd, an artist in the Victorian age. He was a real person, and he showed great promise. Which was good; his father had decided that was what Richard would do. Another son he directed to take over the pharmacy; another was consigned to manual labor. Richard’s father was a bit of a control freak where his children were concerned. We first meet Dadd in the Bethlem Royal Hospital-the infamous Bedlam asylum- in 1853, when he meets Charlotte Bronte, also, obviously, a real pers Mad Richard is Richard Dadd, an artist in the Victorian age. He was a real person, and he showed great promise. Which was good; his father had decided that was what Richard would do. Another son he directed to take over the pharmacy; another was consigned to manual labor. Richard’s father was a bit of a control freak where his children were concerned. We first meet Dadd in the Bethlem Royal Hospital-the infamous Bedlam asylum- in 1853, when he meets Charlotte Bronte, also, obviously, a real person. The meeting, however, is artistic license. Charlotte is visiting Bedlam- and some prisons and poor houses as well- to gather information for a ‘social issues’ novel she is thinking about writing. This short visit is what the novel hinges on. The rest of the book alternates between Dadd’s life and Bronte’s. We follow Dadd from his childhood, through art school, and his association with The Clique, a small group of fellow artists who shared his ideals. All seems well, until his father badgers him into going with a rich patron to Egypt as the trip’s illustrator. It is on this trip, which Richard had not wanted to go on, that mental illness strikes. Meanwhile, Bronte is immured in the rural home of her father. All her siblings are dead and she suffers from unrequited love; she wonders what the rest of her life will be like. Should she continue as she has and be lonely, or settle for a man who is agreeable but who she does not love? Both Bronte’s and Dadd’s stories are interesting, but I never did figure out what really united them, other than that they both had overbearing fathers and were very creative. Bronte wrote about average people; Dadd painted fairies. While I didn’t understand the pairing, the writing itself I found wonderful. It’s full of details of mid-1800’s middle class and rural life, as well as of the artistic life. Krueger lets us see into the minds of her protagonists. The story is populated with other Victorian creative types; Dickens, Augustus Egg, Elizabeth Gaskell, and Wilkie Collins are all part of the crew. Everything comes to life realistically under Krueger’s hand. An interesting narrative that weaves together the life of an author and an artist. The insight into genius and Dadd's views on the purpose of his art were my favourite parts of the story, along with his descent into madness. Great to see something interesting and thought provoking and find out afterwards it is from a Canadian author. Will definitely lend this one out. This is a book for bibliophiles, for writers and artists. Lesley Krueger brings to life one of the most respected authors of the 19th century, Charlotte Bronte, with the great Charles Dickens making appearances as well. Then there’s Mad Richard, Richard Dadd, the artist who painted fairies to escape his mind. Krueger’s interpretation of his madness makes him a mesmerizing character. She dissects the minds of Bronte and Dadd to demonstrate the struggle artists go through as they try to create a p This is a book for bibliophiles, for writers and artists. She dissects the minds of Bronte and Dadd to demonstrate the struggle artists go through as they try to create a piece of genius, and the price of the expectations they generate when they succeed. I enjoyed the Charlotte Bronte chapters, but my eyes generally glazed over during the Richard Dadd chapters. And altogether, I just didn't get it. I read an advance reader's copy of this before publication. Fascinating story and the author has a lovely way with words. I applaud her research and her ability to capture the historical feeling of the characters. My only issue with it was that it jumped around a lot and was very hard to follow at times. If I weren't so interested in the actual historical people, I wouldn't have finished it. see my review at Reading World. I admit it took me several attempts in the beginning to keep reading this tale of the certain degrees of separation of 19th-century geniuses in art and literature. There were numerous different themes and unfortunate confusing streaky timelines of presented lives and trials that it lost me more than once. The writing was simply eccentrically beautiful overall though and the chapters regarding Charlotte Brontë definitely kept me turning the pages until the end. Those superbly researched passages along with the creative cameos of artistic and literary “lionesses and players” have me now desiring to revisit every classic mentioned of the era. Only one or two slightly distracting Americanism sprang out in other chapters (or descriptive panels depending of which character the pages were following) and the final sections seemed sadly rushed blotting out the delicate comparisons and associations of personalities that were explored in the opening of this book. Perhaps this is one of those too finely crafted novels that will fully amuse and enchant a certain audience. I really wanted to be a captivated member of that set but I think like any memorable work of art it’s the history and the stories surrounding the central subject we remember best as we walk away. That may be not an intended message but I will certainly be recalling the intriguing tidbits of the 19th century that were shared in Mad Richard and really hope Ms. Krueger may consider dedicating an entire novel to the background corner figures briefly featured in this work. Her distinct vintage elegance of the pen clearly displayed in Mad Richard would be something special to see again and wait for. This book has many elements that appeal to me, particularly that it is an exploration of creativity and the artistic temperament, and also presents a vivid picture of Victorian England. As a former student of Victorian literature and painting, I loved the peek into Charles Dickens' personality and social presence as well as the look at Mrs. Gaskell's domestic life through Charlotte Bronte's eyes. In many ways, this was a book written to appeal to someone just like me. But, it didn't: I found almos This book has many elements that appeal to me, particularly that it is an exploration of creativity and the artistic temperament, and also presents a vivid picture of Victorian England. In many ways, this was a book written to appeal to someone just like me. But, it didn't: I found almost every chapter disturbing. This is a very personal quibble, but if the book had a different title and if the madness of the principal character was not foreshadowed, I know I would have enjoyed the book more. The self-exploration of the young painter ("Mad Richard") was interesting, but because I knew he was on a path of self-destruction, I read with that in mind and didn't give the same consideration to his thoughts or ideas as I would have if I was not expecting catastrophe. Obviously, this was a well considered artistic decision by the author, but it changed how I read the book and affected my enjoyment of it. This is a Goodreads win review. This is a story that takes place in an imagined Victorian England.